Discover a stunning luxury hotel offering a dramatic 14-story atrium and recently renovated accommodations, at Renaissance Atlanta Waverly Hotel and Convention Center. Walking distance to the new Braves stadium, SunTrust Park, and directly connected to the Atlanta Convention Center, this AAA 4-Diamond hotel in Atlanta is the crown jewel of the Galleria area. Guests can enjoy the convenience of nearby Cumberland Mall and Vinings Jubilee, while downtown Atlanta and Hartsfield-Jackson International Airport are just a short drive away. More than 60,000 square feet of flexible space provide the perfect venue for a variety of corporate and social events. 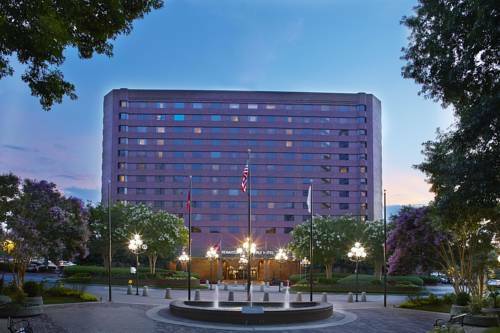 Distinguished among Marietta, GA hotels, Renaissance Atlanta Waverly provides superior, oversized guest rooms and innovative dining options, making this the preferred destination for business, group and leisure travelers, looking for Cobb Galleria hotels. Experience one of the top hotels in Vinings, GA featuring classic elegance at Renaissance Waverly. Discover a stylish American breakfast restaurant, open atrium caf . Our breakfast buffet features traditional fare, such as Belgian waffles, bacon, a variety of cereal and fresh fruit. Available for private lunch and dinner events. Medici serves Tuscan-inspired favorites including handmade pastas, fresh seafood and prime cuts of meat. This restaurant by Cumberland Mall uses Waverly Herbs and other fresh, local and sustainable ingredients. Take a break from the day with our Reformation Beer on Tap, and Signature Cocktails hand crafted by our Trained Mixologists. We serve Lunch and Dinner daily. Look for our Renaissance Calendar for RLife Live performances throughout the month. Enjoy premium coffee and light pastries at KoFi, located in our lobby, featuring the best beans sourced plus two seasonal Organic and free trade beans. Try our pour over coffee; a pure, non-chemical, non-electric method to get the freshest cup of coffee.